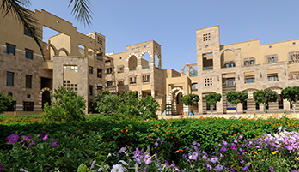 The AUC School of Business was established in 1919 and is a top private university in Egypt with Triple Crown Accreditation (AACSB, AMBA, EQUIS) – placing the school among the top 1% of schools worldwide. AUC offers 37 bachelor’s degrees, 44 master’s degrees, and 2 doctoral degrees in applied sciences and engineering in addition to a wide range of graduate diplomas in five schools: Business, Global Affairs and Public Policy, Humanities and Social Sciences, Sciences and Engineering, and the Graduate School of Education. There are currently 6,659 students and 436 faculty.